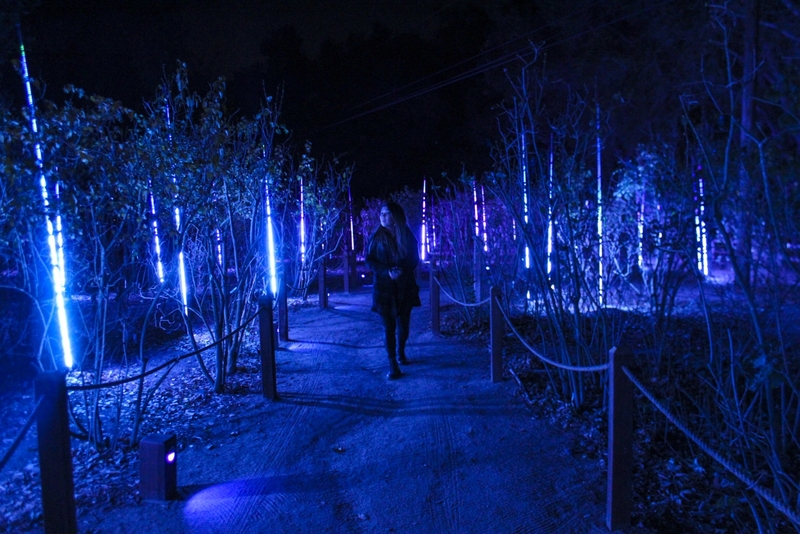 Lightswitch and 4Wall Transform Descanso Gardens into Enchanted: Forest of Light | Press Center | 4Wall Entertainment, Inc.
Enchanted: Forest of Light is an interactive, nighttime experience unlike anything else in Southern California, featuring a one-mile walk through 10 distinct lighting displays in some of the most beloved areas of Descanso Gardens. Lighting and visual design firm Lightswitch is the mastermind behind the experience and partnered with 4Wall's Systems and Design division to create custom design features throughout the walking tour. 4Wall also provided a substantial rental package of over 400 light fixtures. Lightswitch designed "Illumination" at The Morton Arboretum in Chicago for the past 5 years and Descanso Gardens liked that show very much as it aligned creatively with what they were wanting to do. "They were looking for something different than the normal holiday lights display," said LD Chris Medvitz. "They wanted something that was less about covering everything with twinkle lights, and more of a 'nature+light' creative approach." About 45% of the elements in the Enchanted Forest are custom designed and fabricated for this experience. The show is conceived to run annually in perpetuity, so many of the elements had to be engineered and built to last many years. This ranged from simple scenic element fabrication to wayfinding signage, to numerous types of custom light fixtures, to engineering interactive sensors and controls. 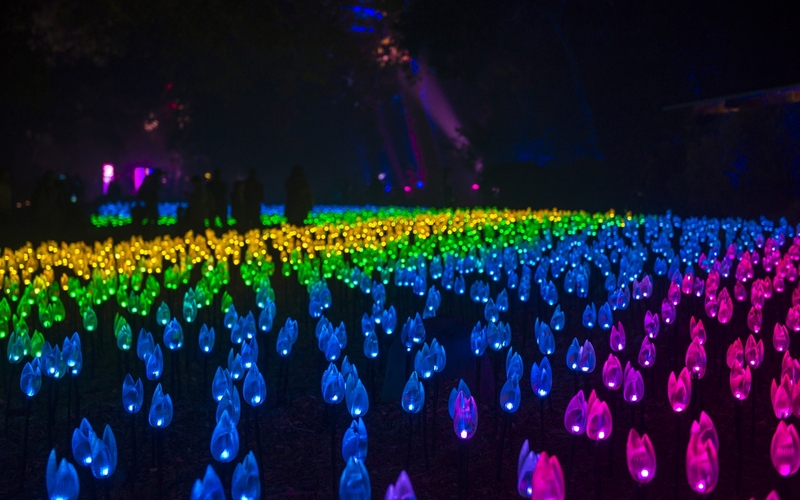 The enchantment begins with the first experience, titled 'Flower Power', which contains 4,000 pixel-mapped tulip-shaped LED lights inspired by Descanso's well-known spring tulip display. The original display was almost doubled in size this year and featured all-new sound and media content making this one of the most photographed areas of the show. 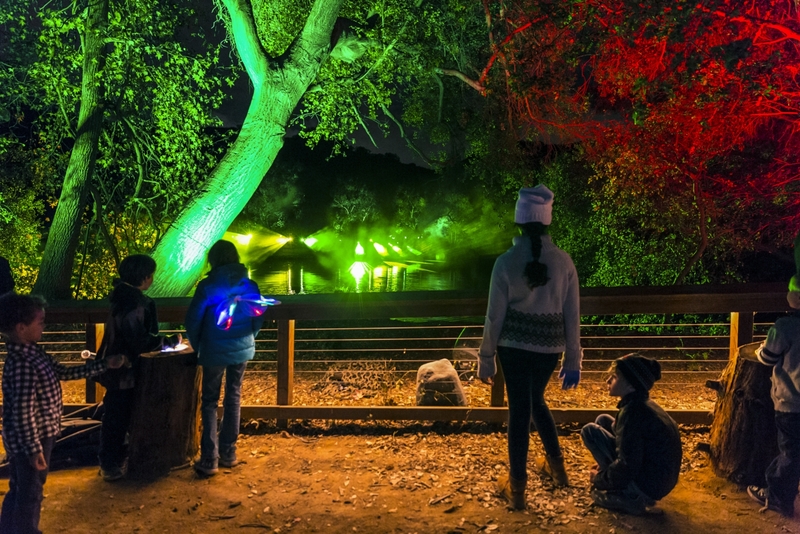 Next is 'Rainbow Sycamores', Descanso Gardens' towering Sycamore trees are aglow with colorful moving lights that guests operate by way of touch-sensitive illuminated columns. Each column animates with color and activates the lights on its corresponding tree when a guest touches or hugs it. New to the 2017 experience is 'Starlight Garden', featuring 'Celestial Shadows' by Oakland-based artist HYBYCOZO. These internally illuminated geometric sculptures, some grounded on pedestals and others free to spin and twirl, explore light and shadow through abstract mathematically-derived patterns. The hanging lanterns invite an interactive twist, and the patterns cast on the ground create a mesmerizing display of dynamic art. 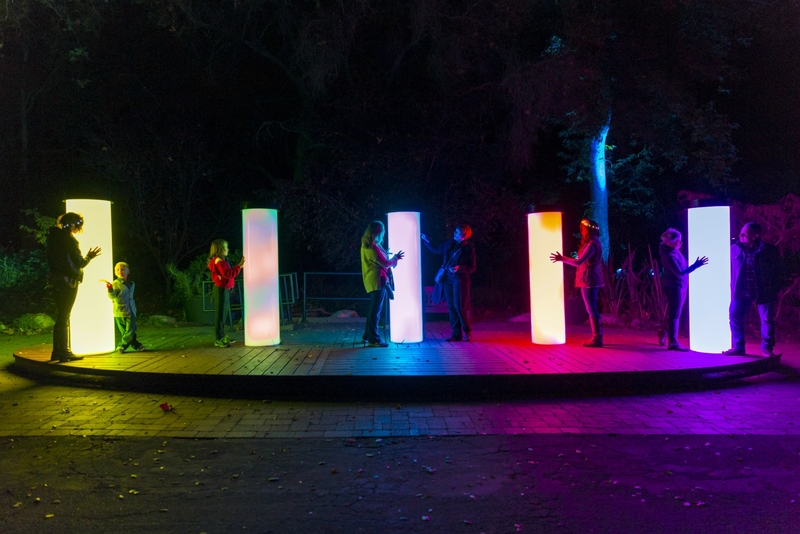 'Lightwave Lake' utilizes the botanic gardens' lake to create a dazzling light display that allows visitors to change the color of the trees and take control of a bank of moving lights. Interactive buttons and joysticks are a kid favorite in this area which saw a significant landscaping remodel this year. The buttons and joysticks are mounted in stumps from naturally downed trees local to Descanso. 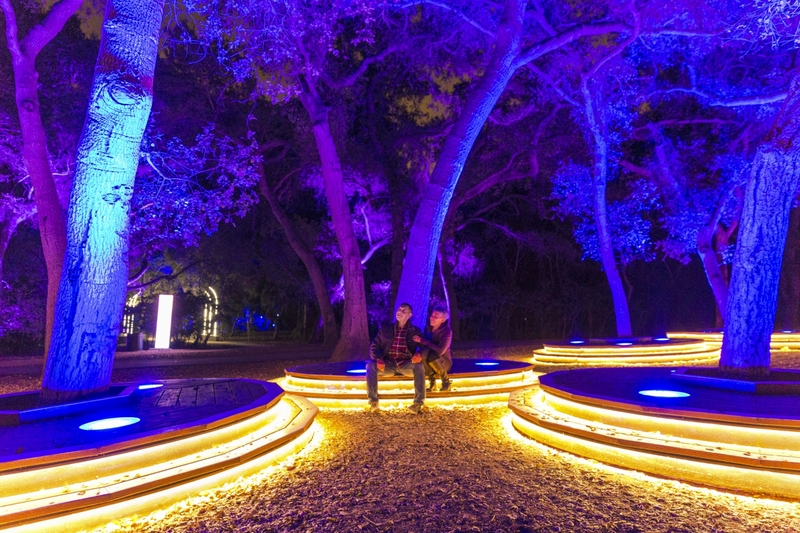 Another interactive installation follows with 'Symphony of Oaks', where guests can control not only the lights but also the music by stepping on platforms encircling the Gardens' collection of coastal live oaks. This area saw significant upgrades to the 4Wall engineered platforms, integrating built-in step lighting, completely new interactive and music systems, and an increase in the overall quantity of platforms by 50%. Descanso Gardens' famous camellias are highlighted in shades of blue and red choreographed to ambient music in the 'Fantasy Forest' display. In addition to the more than 600 varieties of camellias, a lighted archway and gazebo, as well as a floating chandelier and atmospheric fog effects add to the scene. 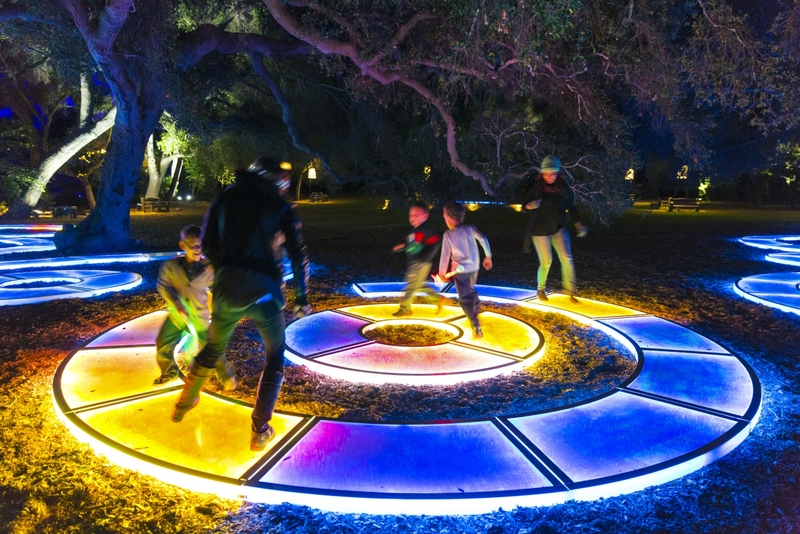 'Luminous Lawn' showcases "Aqueous," a new interactive sculpture by artist Jen Lewin, in which visitors can change the colors of lighted pathways by walking on them. The nearby Theater under the Oaks saw the addition of a monolithic video wall displaying ambient media art designed by Lightswitch. 'Ancient Forest' features plants that existed during the dinosaur era. 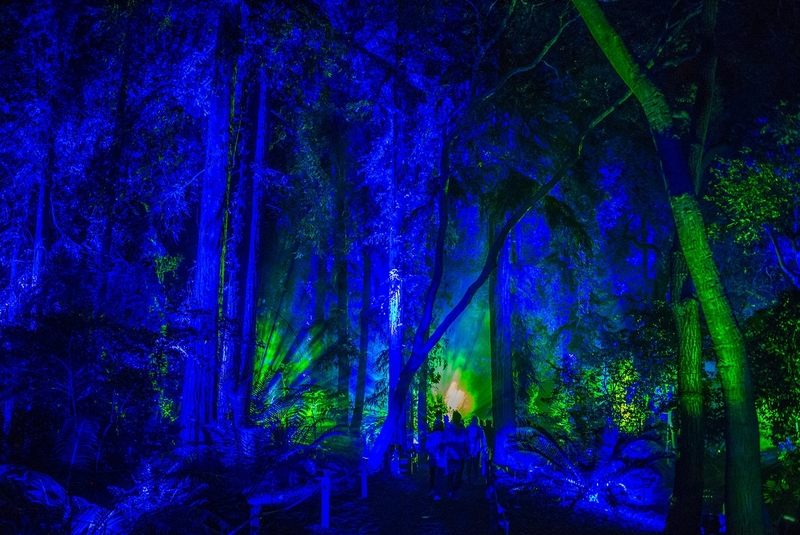 A 200-foot-long pathway bathed in sparkling laser 'fireflies' leads to a forest of Redwood trees and cycads dramatically illuminated in what was one of the standout audience favorites of the show. 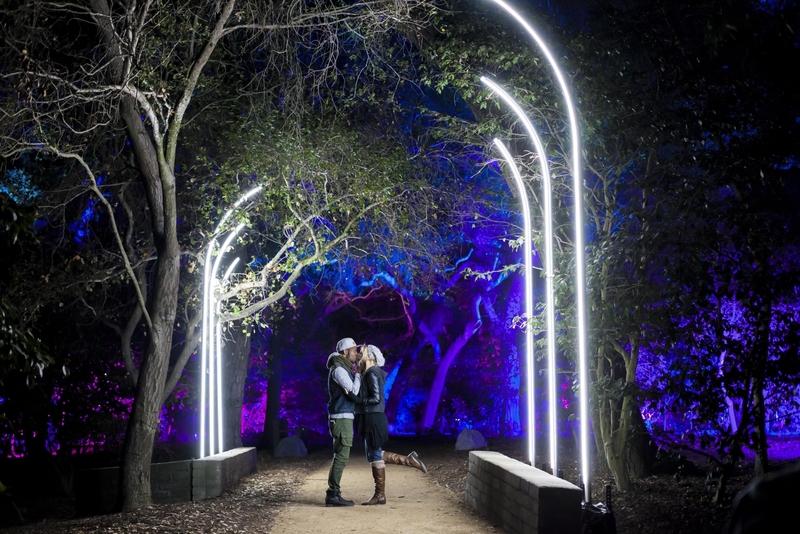 Also new in 2017 is 'Pixel Grove,' a dormant lilac garden brought to life in the winter by a field of 3-meter-tall columns of LED pixels. Media created by Lightswitch mapped to the columns created a striking juxtaposition of minimal technological forms amongst the leafless plants. 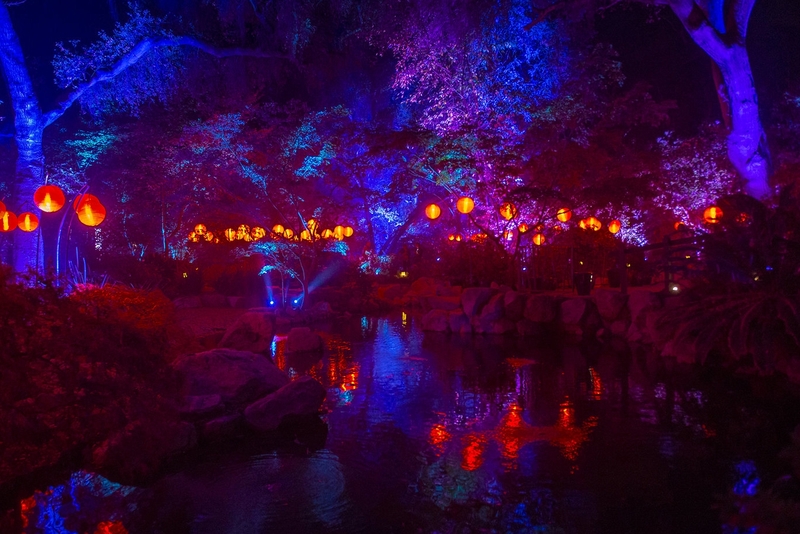 For the final experience, 'The Garden of Good Fortune', Descanso's signature Japanese Garden is decorated with hundreds of glowing red lanterns amidst a background bathed in cool hues and serene music to simulate a frozen winter scene. 4Wall provided over 400 light fixtures consisting of Chauvet Colorado 1 Solos, Colorado 2 Quad Zooms, Elation Proteus Hybrids, Elation SixPAR Z19s, Elation SixBar 1000s, and Martin MAC Aura XBs which were dispersed throughout the garden providing a dramatic ambiance. Each area also has its own MA Lighting grandMA onPC playback. "We had a total of 5 grandMA2 onPC consoles and 2 show computers running the pixel control in 'Flower Power' and 'Pixel Grove'," said Project Manager Ryan Smythe. "None of the areas talk to each other or share control. Each platform in 'Symphony of Oaks' is 100% stand alone with internal control. All it takes is power." 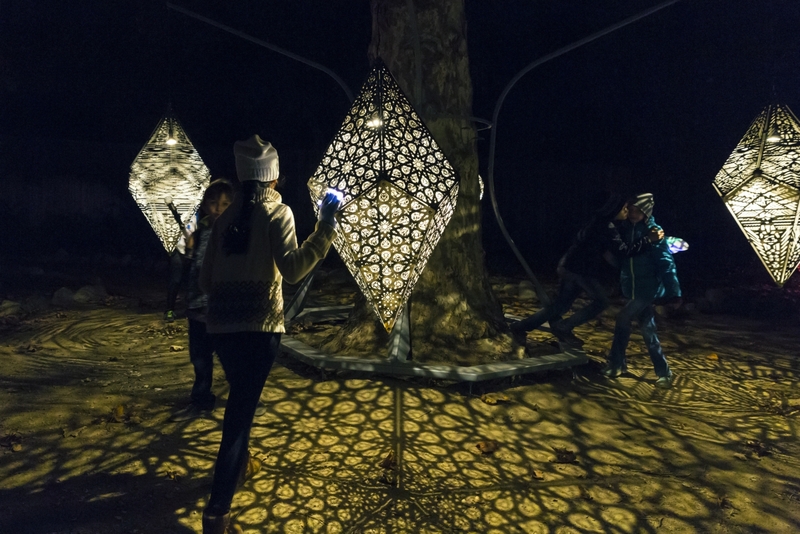 The Enchanted Forest took 5 weeks to install and 1 week to strike, rain or shine. In total it's roughly 55 acres of the park. 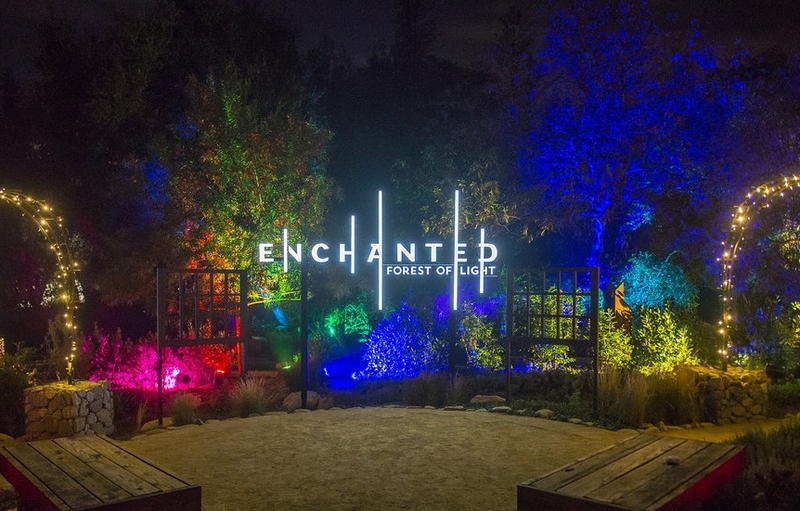 "Enchanted: Forest of Light is a very unique and challenging project to take on but one that has been incredibly fulfilling to be a part of," said Director of Systems and Design Brent Pritchett. "This project uses so many areas of 4Wall expertise including the supply of rental equipment, fabrication of custom interactive elements, labor, project management and system design." Pritchett continued, "It was great supporting the beautiful design work by Chris Medvitz and his team at Lightswitch. Being able to execute such an amazing guest experience that has quickly become a seasonal tradition for so many in Southern California is an incredible feat for everyone involved."